Monday Mural: the dreamer or the dream? This mural adds charm to a less than charming block. I can't tell you who did it or what it means, but it has a dreamy, mystical quality to me. Also love the stylized henna hands floating on either side of the doorway. Monday Mural: whose a good boy? The Wag Hotel boards your canine friend when you're out of town. They've wrapped their building in great photographic portraits that are charming to view. A great way to advertise, especially when you face a freeway as this building does. When it gets too cold to go out on the water, the stacked boats make an interesting sculpture. I love this woman's blue veiled serenity. She reminds me of a young Coretta Scott King, hence my thought to post her image on ML King Day. Found in West Oakland. It took me a while to grok this image and then it came to me. It's an aerial view of the eastern estuary! The circle in the upper right corner is the A's ballpark minus the Oracle arena next door. The upper left represents the island city of Alameda. The peninsula in the lower portion is the airport. All the bright yellow lines represent the freeway, bridges, and main streets in the area. The blue water is the estuary which runs in from the Bay. The mural, done this year by Alan Leon, is formally named Fields of Dreams: the fabric of the city. His work graces the freeway support piers in the Temescal District and was featured here. There are lots of picnic tables along the estuary shore. This one offers shade but no shelter from the rain. It looks like the El Niño has arrived. 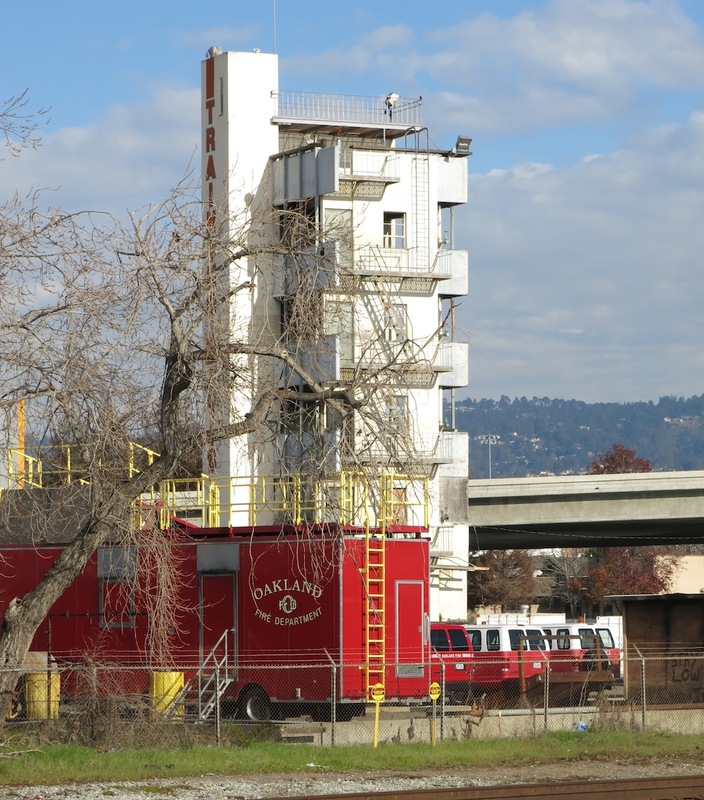 I usually see this training tower from the freeway that you see in the background of the photo. This angle is new to me and happily adds a lot of color from the fire trucks. This new mural faces onto a freeway on ramp in downtown Oakland. Ryan Montoya is a Mescalero Apache from southern New Mexico while Ernest Doty is a local artist who grew up in Albuquerque. I look at the mural and think of curanderas, the tales of Don Juan, magic mushrooms, Salvador Dali, and science fiction. And you?